Snacks and confectionery multinational Mondelez has announced the extension of its Maynard Bassetts Wine Gums range with a new Mocktails variant. The new jelly sweets will contain three non-alcoholic flavours – Strawberry Daiquiri, Pina Colada and Cuba Libre – and will be targeted at younger adults with an emphasis on the “night in” occasion. Communication manager Susan Nash added: “We want to bring new consumers to the brand and increase sales among shoppers who are increasingly entertaining at home”. 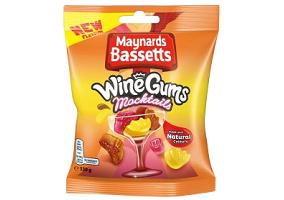 Maynard Bassetts Wine Gums Mocktails will be available from early March in an 165g bag with an RRP of £1.32 ($1.83), as well as in a £1 ($1.38) price-marked pack.